Acne vulgaris, generally known as acne, is a kind of inflammatory superficial skin condition that affects the oil-secreting glands of your skin. Most of the youngsters experience intense acne attacks and struggle a lot to get rid of those whiteheads, blackheads, and the redness of the face and skin. A recent Breakthrough in Acne Research Reveals that over three-quarters of people between the ages 11 and 30 will get acne, and it affects every race as well as both men and women. Young adults and adolescents are the most common people to get acne; however, 50-year-olds have still gotten those irritating bumps as well. You may find several acne treatments, acne lotions and creams out there in the market, but hardly any of them give good results. 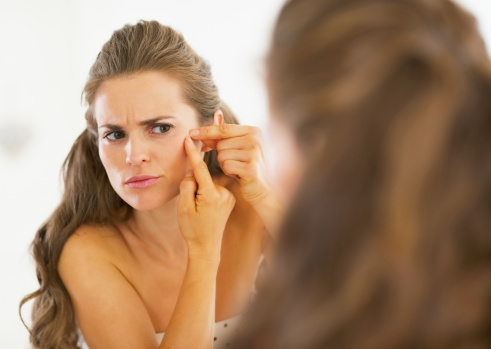 Hormonal complications, lack of hygiene, sebum, infection and bacteria are some of the primary causes of acne. When you are at adolescence, your hormone androgen starts to rise, which makes the oil glands to grow under the skin, producing more oil. Ultimately, the cellular walls begin to break down due to excessive sebum and it causes bacteria to grow. Proper diet plays an important role in preventing acne attacks. In the following article, we’ll see top acne-triggering foods to avoid and the foods that you should include in your daily diet in order to prevent acne. High-Fiber Foods: It is extremely helpful to clear your blemishes when you increase your fiber intake of vegetables, fruits (not too sweet), and oats and other whole grains. Organic is best to eat whenever possible. Vitamins and Minerals: Vitamin A foods (dark green leafy vegetables, squash, and pumpkin) can decrease sebum production and keratin buildup, which are factors that cause acne growth. Vitamin B is needed for skin, hair, and nails, and a deficiency can cause acne. Foods high in B vitamins include dark green leafy vegetables, whole grains, avocado, and Brewer’s yeast. Also, a zinc deficiency promotes the conversion of testosterone to DHT (dihydrotestosterone), which can lead to hair loss in men. Whole grains, legumes, nuts, and pumpkin seeds are good sources of zinc. Organic Animal Products: To avoid antibiotics, steroids, and growth hormones in factory-farmed animals, it is best to choose organic and grass-fed meats, free-range poultry and eggs, and wild-caught fish. Fish and EFAs: Wild-caught fish that contain essential fatty acids, including omega-3s, are good to reduce inflammation such as acne breakouts. Salmon, mackerel, and fish-oil supplements are good ways to get more omega-3 into your acne-fighting diet. Low-Glycemic Foods: It is a good idea to regulate your blood sugar levels, and eat foods low on the glycemic index, which include whole grains (such as quinoa or brown rice), legumes (green lentils or chickpeas), many green vegetables (broccoli or cabbage), and many fruit (figs, plums, grapefruit). A well-balanced diet is important; however, be sure to wash your face too. Recommended natural face-cleaning washes include Calendula Facial Wash or Dr. Bronner’s. Lavender essential oil or tea tree oil are both considered good natural antibiotics and antiseptics for your individual blemishes. When you mix one part apple cider vinegar and 10 parts water, the formula helps balance the skin’s pH.